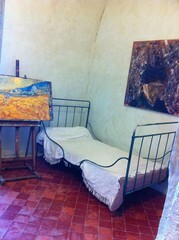 Van Gogh's Room St Remy de Provence. All over the U.S. we find people who like French Chanson. Some speak French, many don't. We bring the stories of the artists and their songs in English to enable everyone to enjoy the genre. To date, in Series 1 through 9, we have introduced 270 songs to our listeners and we are only getting started. From the 50's to today, "Bonjour Chanson" brings you a kaleidoscope of artists and songs. Hopes, regrets, struggles, reminiscences, joy and anger, despair and joy. All of human life is there. We bring it to you in English and when you hear the songs in French, you can truly enjoy them because you'll know what they are about. Series 10 brings you 5 more Episodes, each with 6 artists and songs. Enjoy! Bonjour Chanson Series 10, Episode 49. A selection of six diverse French language artists are introduced in English with one of their songs. The genre may prove to be addictive! Bonjour Chanson Series 10, Episode 48. Bonjour Chanson Series 10, Episode 47. Six Francophone artists interpret one of their songs in French. We'll tell you about them and their songs in English. Bonjour Chanson Series 10, Episode 46.